For the eighth straight day, protesters are swarming the streets of Cairo demanding President Hosni Mubarak step down and end his 30-year rule. Our blog covers the latest news out of Egypt. 7:49 p.m. ET "CBS Evening News" Anchor Katie Couric reports from Liberation Square, where Egyptians are demanding to be liberated from poverty and oppression. It's the biggest demonstration by far since the uprising began one week ago. The ancient city of Cairo is the epicenter of an uprising by the people of the country who say the time has come for a new Egypt. When the man many say represents old Egypt finally spoke to the people he only stoked the fires of anger and resentment. 7:45 p.m. ET "Mubarak wake up!" chanted a crowd in Alexandria, Egypt, thousands of voices rising up in this ancient city founded by Alexander the Great, Chief Foreign Correspondent Lara Logan reports. Today, Alexandria is the stronghold of Egypt's extremist Muslim Brotherhood and scene of some of the largest -- and most violent -- demonstrations over the past week. But even here, this revolution belongs to the people -- not to the Muslim Brotherhood. 7:38 p.m. ET On the "CBS Evening News", Correspondent Mark Strassmann reports that many people who have been moved to participate in the revolt never imagined themselves as revolutionaries. By and large the faces of this revolt are political and religious moderates, not professional protesters, but in many cases, educated, secular, first-time activists. 7:06 p.m. ET Standing shoulder-to-shoulder with their male counterparts, Egyptian women have been a small but substantial part of the political events unfolding in their country. 6:53 p.m. ET "What is clear, and what I indicated tonight to President Mubarak, is my belief that an orderly transition must be meaningful," President Obama said in a televised statement. "It must be peaceful, and it must begin now ... the process must include a broad spectrum of Egyptian voices and opposition parties. It should lead to elections that are free and fair, and it should result in a government that's not only grounded in democratic principles but is also responsive to the aspirations of the Egyptian people." 6:47 p.m. ET "He recognizes that the status quo is not sustainable," President Obama said in a televised statement about Egyptian President Hosni Mubarak. 6:35 p.m. ET President Obama spoke with Egyptian President Hosni Mubarak for approximately 30 minutes Tuesday evening, CBS Radio News Correspondent Mark Knoller reports. 6:29 p.m. ET Egyptian President Hosni Mubarak's announcement Tuesday that he would not run for election in September and would seek to bring constitutional and social reforms during the remainder of his term drew mixed reactions from observers and members of the opposition movement. 5:55 p.m. ET President Obama is expected to deliver remarks on the situation in Egypt later Tuesday evening in the Grand Foyer of the White House, CBS Radio News Correspondent Mark Knoller reports. 5:06 p.m. ET Publication has been moved up for a book by Mohamed ElBaradei, the Nobel peace laureate and Egyptian opposition leader, the Associated Press reports. Publisher Henry and Holt announced Tuesday that the change was made in response to the massive uprising in Egypt. 5 p.m. ET The Guardian newspaper of London published in its live blog a report from a reporter in Cairo's Tahrir Square that the protesters' response to Egyptian President Hosni Mubarak's speech was not positive. "People were bursting with hostility, many people held up their shoes in the air, which is, as you probably know, is one of the gravest insults you can show people in Arab culture, and as he announced that he would not be running in the September elections many of those shoes were hurled at the screen." 4:47 p.m. ET President Obama watched Egyptian President Hosni Mubarak's televised speech, CBS Radio News Correspondent Cami McCormick reports. The White House source did not know whether Mr. Obama planned to publicly respond to the speech. 4:32 p.m. ET An Al-Jazeera television correspondent reports from Cairo's Tahrir Square that after Egyptian President Hosni Mubarak announced he was going to stay in office, protesters chanted "down, down with Mubarak" and that he had to leave. 4:16 p.m. ET In his speech on Egyptian state television, President Hosni Mubarak said he intended to die in Egypt. "I have lived in this country; I have fought for it," said Mubarak. "I have defended its sovereignty and interest, and I will die on its land, and history will judge me and others." That statement gives the impression that Mubarak decided not to take the same route as ousted Tunisian President Zine al-Abidine Ben Ali, who fled his country after an uprising there last month. 4:08 p.m. ET "I pray to God to guide me to the successful right path," Egyptian President Hosni Mubarak said on state television. 4:06 p.m. ET "I have spent enough time serving Egypt," Egyptian President Hosni Mubarak said on state television. 4:04 p.m. ET "I tell you in absolute veracity that in light of the circumstance that I did not intend to run for the presidency," Egyptian President Hosni Mubarak said on state television. 4:01 p.m. ET "The incident of the past few days require us all, one and all, people and leadership, to choose between chaos and stability," Egyptian President Hosni Mubarak said on state television. 3:47 p.m. ET The United States has no plans to redeploy troops or ships in response to the unrest roiling Egypt and the instability in Tunisia and Jordan, the Associated Press reports the head of the U.S. Central Command said Tuesday. On a visit to London, Gen. James Mattis said military leaders and lawmakers were closely watching developments, but that he had no orders to rearrange his forces in response. 3:40 p.m. ET More than 45 minutes after Egyptian state television announced that President Hosni Mubarak would "shortly" give an "important speech", it appears that the word shortly has different definitions in Egypt and in the United States. It took about four hours for Mubarak to appear before a television camera Friday night after an announcement that Mubarak would speak "shortly". 3:32 p.m. ET A senior American official told the Associated Press that U.S. envoy Frank Wisner made clear to Egyptian President Hosni Mubarak that it was the U.S "view that his tenure as president is coming to a close." 3:22 p.m. ET Protesters in Cairo's Tahrir Square are chanting what translates to "may it be tonight", Al-Jazeera television reports. 3:12 p.m. ET The Obama administration on Tuesday opened talks with a possible successor to embattled Egyptian President Hosni Mubarak as the U.S. ramped up outreach to the hundreds of thousands determined to force their long-time leader out of power, the Associated Press reports. 3:08 p.m. ET Egyptian President Hosni Mubarak will reportedly transfer his executive powers to recently appointed Vice President Omar Suleiman, an Egyptian journalist told Al-Jazeera television, CBS Radio News reports. Mubarak was visibly angered by what he heard from U.S. envoy Frank Wisner, the journalist, Ibrahim al Darawy, told Al-Jazeera. Wisner has been reported to be the U.S. official that delivered a message from President Obama to Mubarak that the 30-year ruler should not run for re-election this fall. 2:58 p.m. ET A senior U.S. official heard from "reliable contacts in Cairo" that Egyptian President Hosni Mubarak will not seek re-election, CNN reports. 2:51 p.m. ET Egyptian state television reports President Hosni Mubarak is about to give an "important speech" shortly, the Associated Press reports. 2:42 p.m. ET U.S. envoy Frank Wisner met with Egyptian President Hosni Mubarak to discuss the crisis in the country, the Reuters news agency reports. The New York Times reports that Wisner delivered a message from President Obama that Mubarak shouldn't run for re-election this fall. The Times describes the message as "not a blunt demand for Mr. Mubarak to step aside now, but firm counsel that he should make way for a reform process". Wisner is a former American ambassador to Egypt. 2:28 p.m. ET President Obama has told Egyptian President Hosni Mubarak that he should not run for previously scheduled elections this fall, The New York Times attributes to U.S. diplomats in Cairo and Washington. 2:21 p.m. ET Al-Jazeera television knocked down a report that Egyptian Vice President Omar Suleiman met with representatives of the opposition, CBS News' Khaled Wassef reports. Al-Arabiya television earlier reported that Suleiman started meetings with opposition representatives. Al-Jazeera reported that Suleiman only met with his advisers. 2:03 p.m. ET Egyptian Prime Minister Ahmed Shafiq told Al-Hurra television that opposition representatives rejected dialogue with the government Tuesday, CBS News' Khaled Wassef reports. Shafiq's comments follow an Al-Arabiya television report that Egyptian Vice President Omar Suleiman started meetings with opposition representatives Tuesday. "If we were a bit late in calling for dialogue, does that mean that we should roll over and die?" Shafiq told Al-Hurra. "It is unacceptable to reject dialogue at this particular time. "I am willing to engage in public dialogue with the youths at any time," Shafiq told Al-Hurra. 1:47 p.m. ET Opposition leader Mohamed ElBaradei told Al-Arabiya television that protesters are calling Friday "the Friday of departure" for Egyptian leader Hosni Mubarak, CBS News' Khaled Wassef reports. "The youths hope that this would end today," ElBaradei told Al-Arabiya, "and if not today, it will be by Friday at the latest. Next Friday has been labeled 'the Friday of departure'. I hope that President Mubarak would react before that and exit the country after 30 years of his rule. I don't think he wants to see more bloodshed." ElBaradei also said he's spoken with former leaders of the Egyptian army. "There are many former leaders in the army who spoke to me and expressed their regret over the situation of the Egyptian people and over the fact that we continue to see violence, to see Egyptian people dying, and President Mubarak does not read, hear nor understand that he needs to go now," ElBaradei told Al-Arabiya. ElBaradei said he plans to join one of the protests happening Tuesday night. He would not say if he would join the massive demonstration in Cairo's Tahrir Square. "For security reasons, I couldn't tell you where or when I will be joining the protests today," ElBaradei told Al-Arabiya. "As you saw two days ago, when I went to Tahrir Square, how difficult it was, but I will be with the people today, and I hope that we all, the people, the army and everybody, that we all reach the end of this phase that could not last not even a day longer." 1:38 p.m. ET Al-Arabiya television reports that Egyptian leader Hosni Mubarak is expected to pledge to accommodate all of the protesters' demands and to announce that he will not run in this year's scheduled presidential elections, according to CBS News' Khaled Wassef. 1:30 p.m. ET Al-Arabiya television reports that President Hosni Mubarak will give a speech later Tuesday, according to the Reuters news agency. 1:11 p.m. ET The Associated Press published a handy cheat-sheet summarizing the demands of the Egyptian anti-government protesters. The movement began with an Internet call for "freedom, dignity and democracy." The top demand in eight days of protests has been the ouster of President Hosni Mubarak and no transfer of power to his son, Gamal. They then have a sequential list of demands. They want negotiations on a transitional period during which the constitution will be rewritten to set term limits on the presidency, among other changes. They then want free and fair elections for a president and new parliament. 1:04 p.m. ET In a popular YouTube clip, an 8-year-old Saudi girl named Juju gives advice to embattled Egyptian President Hosni Mubarak. 12:52 p.m. Missed Senate Foreign Relations Chairman John Kerry's op-ed in Tuesday's New York Times? He also called for Egyptian leader Hosni Mubarak to step down in front of cameras on Capitol Hill. 12:37 p.m. ET State Department spokesman P.J. Crowley Tweeted that U.S. Ambassador to Egypt Margaret Scobey spoke with opposition leader Mohamed ElBaradei Tuesday. 12:30 p.m. ET The British Broadcasting Corp. published an article on its website analyzing the Obama administration's response to the unrest in Egypt. A Washington insider tells the BBC that the White House "can't pull the plug because of the alarm that would cause to all the other authoritarian allies in the region." 12:16 p.m. ET Hundreds of thousands of people have flooded Tahrir Square in Cairo, forming Egypt's largest anti-government demonstration. The protesters, who are demanding that Egyptian President Hosni Mubarak step down, joined together in prayer. 12:13 p.m. ET An Al-Jazeera correspondent reports that a joke being told among the protesters is that "the reason why Hosni Mubarak isn't leaving the country is because they can't find another country to take him." 11:54 a.m. ET A popular anti-government uprising in Tunisia has turned the Cold War-era phrase "domino effect" on its head, CBSNews.com's Joshua Norman writes. Much of the Middle East and its neighbors are fertile ground for popular uprisings. Norman explores which country could be the next one hit by this anti-regime wave. 11:05 a.m. ET: As darkness falls, food and water is being passed out to demonstrators. 10:57 a.m. ET: Cairo-based journalist Sarah El Sirgany tweets that a stage, sound system and projector are being set up in Tahrir Square, in anticipation of someone addressing the protesters gathered there. Exactly who will address the crowd is unknown. 10:53 a.m. ET: The Associated Press reports Cairo Airport is in complete disarray, overwhelmed with more than 18,000 stranded passengers. Airport staff was scarce, food supplies were dwindling, and flight information was non-existent. Tourists told the AP some policemen even demanded substantial bribes before allowing foreigners to board their planes. At least 35 charter flights left Cairo early Tuesday, an airport official said. The U.S. State Dept. evacuated more than 1,200 Americans from Cairo on nine charter flights Monday and said it expected to fly out roughly 1,400 more in the coming days. The U.S. was also trying to arrange evacuation flights from the Egyptian cities of Aswan and Luxor. The 1national carrier EgyptAir has been canceling about 75 percent of its flights because it is unable to field the necessary crew. 10:42 a.m. ET: Darkness is beginning to fall on Tahrir Square, and reports are few are leaving - and more are arriving. Many plan to stay the night, and have brought sleeping bags. 10:31 a.m. ET: The Washington Post reports that among wounded looters who were taken to hospitals during this week's unrest in Egypt were members of the undercover police. Several cases of police - loyal to President Mubarak's regime - who were looting and committing acts of violence was described as an attempt to stoke fear of instability among the people, as popular support for anti-Mubarak demonstrations was growing. Peter Bouckaert, the emergency director at Human Rights Watch, told the Post said hospitals confirmed that several wounded looters shot by the army were carrying police identification cards. They also found several cases of looters and vandals in Cairo and Alexandria with police identification cards. 10:16 a.m. ET: In an interview with Al-Arabiya television, dissident Mohamed ElBaradei said that President Hosni Mubarak should be allowed to step down without fear of prosecution. He also said no dialogue between the government and the coalition of opposition groups cannot begin until Mubarak leaves the country, and said he must be gone by Friday. "There can be dialogue but it has to come after the demands of the people are met and the first of those is that President Mubarak leaves," ElBaradei said. "If President Mubarak leaves, then everything will progress correctly." 10:12 a.m. ET: Agencie France Press reports that the U.S. ambassador to Egypt has spoken by phone to Mohamed ElBaradei, a leading opposition figure. 10:25 a.m. ET: In a column titled "Obama's Betrayal" in the Jerusalem-based Haaretz, Ari Shavit said President Obama betrayed "a moderate Egyptian president" who was loyal to the U.S. and promoted stability and moderation in the Middle East, and thus risks America's status as a superpower and reliable ally. "Throughout Asia, Africa and South America, leaders are now looking at what is going on between Washington and Cairo. Everyone grasps the message: 'America's word is worthless ... America has lost it.' "
10:00 a.m. ET: In an interview with CBS News correspondent Elizabeth Palmer in Cairo, the deputy head of the Muslim Brotherhood - one of many opposition groups joining in the coalition to protest against President Mubarak's rule - said today that they would support continuing Egypt's peace treaty with Israel, but conditionally. "We will respect the peace treaty with Israel as long as Israel shows real progress on improving the lot of the Palestinians," Dr. Mahmoud Ezzat told Palmer. When asked whether the Brotherhood wanted peace with Israel, Essat said, "We want peace with all the world." 9:51 a.m. ET: U.S. Sen. John Kerry, D-Mass., writes in a New York Times op-ed today that President Mubarak must step aside. "President Hosni Mubarak must accept that the stability of his country hinges on his willingness to step aside gracefully to make way for a new political structure," Kerry writes. "It is not enough for President Mubarak to pledge 'fair' elections, as he did on Saturday. The most important step that he can take is to address his nation and declare that neither he nor the son he has been positioning as his successor will run in the presidential election this year. Egyptians have moved beyond his regime, and the best way to avoid unrest turning into upheaval is for President Mubarak to take himself and his family out of the equation." 9:45 a.m. ET: Al Jazeera reports that clashes between protesters in the coastal city of Alexandria - where hundreds of thousands are engaging in an anti-Mubarak demonstration - have left at least 100 people dead, and hospitals overloaded with treating the wounded. Alexandria is a bastion of the Islamist opposition group Muslim Brotherhood. 9:39 a.m. ET: Google has launched a special service allowing people in Egypt - where Internet service and text messaging has been cut off - to send Twitter messages by dialing a phone number and leaving a voicemail. The voicemail is automatically translated into an audio file message that is sent on Twitter using the identifying tag #egypt, Google said. No Internet connection is needed. The three numbers Google listed are: +16504194196, +390662207294, and +97316199855. 9:32 a.m. ET: Al Jazeera's crowd estimate in Cairo is up to two million people in and around Tahrir Square - all in defiance of a curfew. 9:19 a.m. ET: The State Department has ordered all non-emergency U.S. government personnel and their families in Egypt to leave the country. The Department said it will continue to assist American citizens seeking to leave the country that has been the scene of unrest. 9:17 a.m. 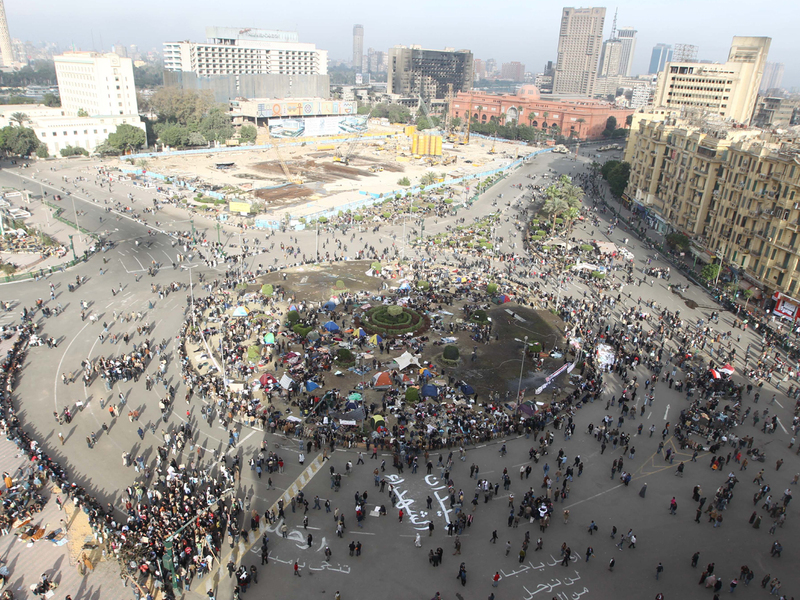 ET: One Al Jazzera correspondent said that the mood among the crowd gathered at Tahrir Square was celebratory, like "an enormous rock festival, maybe even Egypt's Woodstock." 9:05 a.m. ET: The Obama administration is looking to whom among Egypt's opposition figures it can support in the event President Mubarak is unseated from power, and is sizing up Mohamed ElBaradei. Helene Cooper and Scott Shane of The New York Times write that ElBaradei had a contentious relationship with the Bush administration when, as director general of the International Atomic Energy Agency (IAEA), he contradicted Washington's claims of Iraqi weapons of mass destruction and criticized the U.S. invasion. Bush officials tried, and failed, to get him removed from the U.N.'s atomic watchdog agency. Philip Zelikow, an Obama administration official, said ElBaradei's credibility within Egypt was earned in part by his clashes with the Bush administration. "Ironically, the fact that ElBaradei crossed swords with the Bush administration on Iraq and Iran helps him in Egypt, and God forbid we should do anything to make it seem like we like him," Zelikow told The Times. But ElBaradei's stance on other issues - like the blockade of Gaza, which Egypt helps support - may prove more difficult for the White House to wrap its arms around. 8:19 a.m. ET: Jordan's King Abdullah sacked his country's government as thousands of Jordanians protested in the street for the resignation of Prime Minister Samir Rifai, reports the Associated Press. Rifai is blamed for high food and fuel prices and a lack of political reform. 7:51 a.m. ET: According to Al Jazeera, military police have installed barbed wire around Mubarak's presidential palace in Heliopolis. 7:48 a.m. ET: In an appearance on "The Early Show" this morning, president of the Council of Foreign Relations Dr. Richard Haass said that while Mubarak's ouster appears more likely, it may be just the beginning of greater turmoil in Egypt. "The longer this plays out, the more things begin to unravel ... it creates political openings. And what we've learned through history is often not the first phase or even the second phase that matters, it's the third or fourth phase. And clearly the religious radicals ... [will] try to exploit any political openings, which is why it's important that sooner rather than later a dialogue starts to take place, Mubarak leaves office and order is restored and the economy gets started up again." Haass said that what's binding all the disparate elements within Egypt's opposition movement is their focus on unseating Mubarak. "As soon as that's achieved, then you're gonna see the splintering and you're gonna see the radical religious forces, who probably represent a quarter to a third of Egypt, they're gonna go in one direction and all of the civilians [will go in another]. You're gonna see all of the rivalries all the different agendas. And that's why this is a very dangerous situation. So after Mubarak goes ... people shouldn't think that the problem is over. That's when the problem really begins." 7:24 a.m. ET: An Al Arabiya correspondent on the scene describes Tahrir Square as packed, with "not an inch of earth to put one's foot on." Celebrities, intellectuals, artists and actors have been among the many seen in the crowd. 7:00 a.m. ET: The Muslim Brotherhood has issued a statement rejecting dialogue with the Mubarak regime, reports Al Arabiya. CBS News' Elizabeth Palmer will be speaking with a leader of the Brotherhood later today. More details to follow. 6:50 a.m. ET: There are reports of food shortages and security officials taking bribes from foreigners at Cairo's main international airport as an estimated 1,400 Americans and thousands of others attempt to escape Egypt's volatile political unrest. The State Department says 1,200 Americans have been evacuated on government chartered flights already. 5:10 a.m. ET: CBS News correspondent Elizabeth Palmer rode down a hotel elevator on her way to cover the protest in Tahrir Square this morning with famed Egyptian actor Omar Sharif. The Hollywood star, now in his late eighties, told Palmer he fully supported the protesters, calling the anti-Mubarak movement "undeniable." He stressed his foremost concern that, regardless of the outcome, Egypt's relationship with Israel and the U.S. must remain intact. Sharif then called himself, in a self-mocking manner, a "coward," happy to leave the uprising to younger Egyptians. He said he was on his way to Spain later Tuesday. 5:00 a.m. ET: Interesting note from Sky News foreign editor Tim Marshall in Tahrir Square, who says one of the most telling signs of Tuesday's protest is the strong presence of Egyptian women among the crowd. In a traditionally male-dominated society, women are generally more reluctant to voice a strong opinion - particularly on such a politically sensitive theme. Today, more than before, they're out in force. 4:45 a.m. ET: Today could go down in the history of the modern Middle East as the beginning of the end of President Hosni Mubarak's 30-year grip on power in Egypt. A wide but fast-coalescing opposition movement has called for a "march of the millions" across the country today, and Cairo's central Tahrir, or "Liberation" Square, is filling up fast with thousands of people demanding Mubarak's ouster. Egypt's powerful army has given the protest movement its tacit backing, and even Mubarak's longtime ally the United States, while maintaining neutrality in public, seems resigned to the fact that his day has come. The tide of change is sweeping over Egypt, and many expect Tuesday's mass display of discontent to be pivotal. CBSNews.com's Political Hotsheet blog put together a slideshow of Egyptian leader Hosni Mubarak with U.S. presidents and other national leaders during the last 30 years.